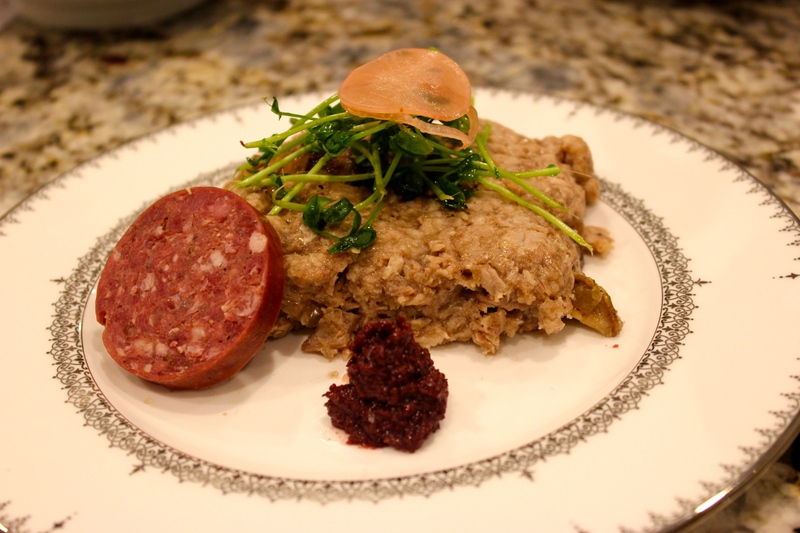 A yummy appetizer made by creating wild pig rillettes with a Sous Vide Supreme Water Oven (or immersion circulator), which can be served as part of an elegant first course or as part of a charcuterie platter for a buffet. While the preparation takes up to three days, most of the time is refrigeration or inactive cooking. Once you season and seal up the vacuum bags with the meat inside, the Sous Vide Supreme Water Oven does the rest. 7 pound Boneless Wild Pig Leg cut into two separate large pieces (I butchered a whole leg and removed the bones and broke it down enough to fit into two large vacuum seal bags). 1-1/2 Tbs. Juniper Berries (found in the spice section of the grocery store). 10 Garlic Cloves, peeled and left whole. 1-1/2 pounds Fresh Shiitake Mushrooms. 2 Shallots, peeled and finely minced. 3 Tbs. Grape Seed Oil (or canola oil, or vegetable oil). 6 Packets Plain Gelatin (I used Knox brand). Butcher wild pig leg into two large pieces and remove the bones (save for another use). In a spice grinder, grind the juniper berries, whole allspice, and black peppercorns to a fine ground. Make a dry rub with the ground juniper berries, ground allspice, ground black peppercorns, garlic powder, onion powder, and Kosher salt. Divide the amount in two and rub all the pig pieces with the dry rub. Using two large vacuum bags, add the pig pieces to the vacuum bags. Add one bay leaf to each bag and one stick of butter to each bag. Divide the garlic cloves and fresh thyme in two, and add each half to the vacuum bags. Seal the bags and refrigerate, overnight, or at least 9 hours. Add water to the Sous Vide Supreme Water Oven (about 4 quarts) or large holding vessel with an immersion circulator attached. Pre-Heat the Water to 160ºF/71ºC. Place the vacuum sealed meat in the water bath, and set a timer for 16 hours. After 16 hours, remove the bags and RESERVE all the cooking liquid, and rendered fat (***you should have about 2-1/2 cups total). Remove the meat and discard the bay leaves and any thyme stems. Separate the meat into large pieces and place in a food processor. Add about 1/2 cup cooking liquid to the meat and gently pulse the meat in the food processor until the meat is broken down, but not too finely. Add a little more liquid if necessary to get a coarse grind on the meat. Set the meat aside to cool. With the remaining 2 cups liquid, add to a saucepan and heat over medium heat and whisk in the 6 packets of gelatin and stir until the gelatin is melted into the liquid, set aside to cool. Peel and finely minced the shallots, set aside. Chop the mushrooms into 1/4 inch pieces, set aside. In a large frying pan, heat the 3 tbs. un-salted butter and 3 tbs. oil over medium high heat. Add the minced shallots, and sauté 2 minutes. Add the chopped mushrooms, and sauté 2 minutes. Season with salt and pepper, and add the cognac. Continue to cook until the cognac evaporates. Remove the pan from heat and cool the mushrooms, completely. In a terrine mould (I used a 16”l x4”w x4”d pullman’s bread loaf pan), line with cling film in both directions. Spread 1/3 of the boar meat in the bottom of the mould and press down gently, then spread out a layer 1/2 of the mushroom mixture. Layer another 1/3 of the meat, then the other 1/2 of the mushroom mixture. Then layer the last 1/3 of the meat on top. Carefully pour the gelatin liquid over the top of the terrine (it might take a few minutes for the liquid to pass through the meat and mushroom layers. Once the liquid is poured over, cover the whole terrine with cling film. Fold back the cling film, and invert the terrine over a platter or large baking sheet and lift out the terrine mould. Remove the cling film and slice the terrine. Serve with wine grape mustard, pickled shallots, french baguette, micro greens or whatever you like.